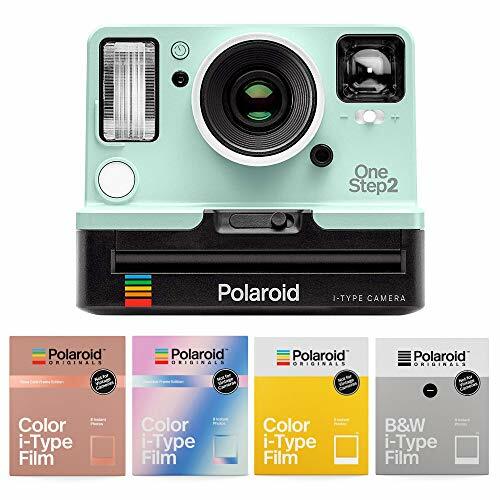 Inspired by the original OneStep camera from 1977, the Polaroid Originals OneStep2 Viewfinder i-Type Camera is a modernized analog instant camera delivering instant photos with a retro vibe. It takes a moment and turns it into something you can hold, something you can share, something real. Simple in use, the one-step camera captures a unique image every time – which is the essence of Polaroid photography. And with the built-in strobe flash and high-quality 2′ to infinity lens, you can be sure every shot is simply amazing. Every camera needs film to go with it. Polaroid Originals i-Type cameras have their own i-Type film, battery-free, unlike the standard film for vintage cameras (meaning it’s easier on the wallet) and optimized for the Polaroid OneStep 2 camera. i-Type film is a new generation of instant film, optimized for i-Type cameras like the OneStep 2. That means you get the best photos possible with your OneStep 2, as crisp, clear and colorful as every photo should be. And because i-Type cameras have their own rechargeable batteries, Polaroid doesn’t have to put one in the film, meaning you save money on every single pack. But don’t try using it in a 600 camera – it won’t work, no matter how nicely you ask it to.